Nursing is a profession in which standards of care are a must. Federal and state standards allow for equal care and treatment of patients in any healthcare organization in any state following the latest evidence-based clinical practice guidelines. Because standardization is so crucial in patient care, state Boards of Nursing have made it easier for nurses to have career mobility and expand their practice to different states. Obtaining an RN license requires different methods based on whether the RN is a new graduate or a transfer from another state. Additionally, Nurse Practitioners (NPs) and Advanced Practice Registered Nurses (APRNs) have additional requirements for licensure. Nurse practitioners and APRNs have additional requirements, such as specialty certifications and proof of continuing education in pharmacology or other areas. Evidence of supervised clinical hours is also a common requirement. Since nurse practitioner scope of practice varies with each state, licensing requirements may also differ. Applicants are encouraged to research specific requirements thoroughly. What is the Difference Between a Scope of Practice and a Scope of Employment? Registered nurses looking to practice in a different state must first review the state board of nursing's requirements for transferring RNs. Some states allow nurses to obtain a license by endorsement, which means they have already met the requirements for licensure with their current RN license. Some states have different requirements, and the RN must obtain a license by examination if those requirements are not met. However, some states are part of the eNLC, which makes practicing in other states easier for RNs. When it comes to RN licensing, reciprocity and endorsement means that educational requirements have been met in the applicant's home state and they have successfully completed the NCLEX exam. Essentially, the applicant is endorsing their license to a new state - they don't need to take another exam or re-take educational classes. The only caveat is that the nursing school must be nationally accredited, not just locally accredited, otherwise it might not be recognized in another state. All states are "reciprocal" in that they all recognize the NCLEX exam and nationally accredited schools of nursing as valid. However, some states have additional requirements that make "endorsing" their license a little more challenging. For example, some states require a valid social security number while others do not. For most nurses, applying for a nursing license by endorsement is not a problem, thanks to the standardization of nursing education and the NCLEX exam in all states. However, additional documentation may be required for some states; it's always wise to look into your state's specific requirements. The Nurse Licensure Compact (NLC) was developed by multiple state Boards of Nursing and allows nurses to have one license that is valid for practicing in multiple states. It is also known as a "multi-state license." The Enhanced Nurse Licensure Compact (eNLC) is an updated version of the NLC. Several licensing requirements were added, and more states became involved. The rationale for the eNLC is to increase access to care, reduce healthcare costs, and support efficient healthcare delivery. For nurses, it offers career mobility and the ability to expand their career options. The eNLC applies to RNs and LPNs only - APRNs are not included in the agreement. 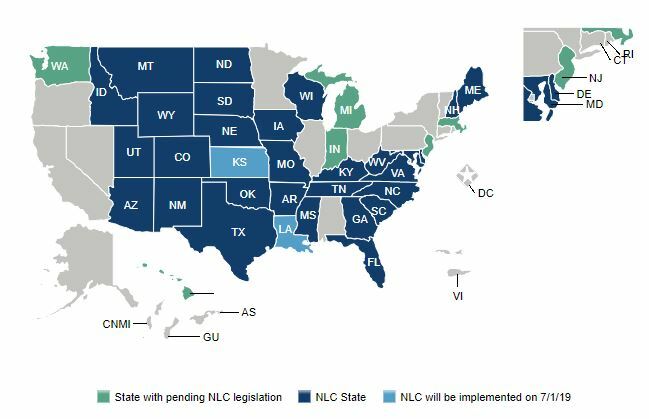 Currently, Michigan, New Jersey, and Massachusetts have pending NLC legislation. The NCSBN maintains an interactive map which provides details on each individual state's status. Screenshot above. Applying for a multi-state license is very straightforward. The nurse must visit the Board of Nursing's website in their home state - that is, where they claim residency - and follow the application instructions on their website. If the applicant's home state is a participant in the eNLC (i.e., a "compact" state), then their license is automatically considered a multi-state license which is regarded as valid in other compact states. It's critical to stress that if a nurse moves out of state, he or she MUST re-apply with the board from their home state's Board of Nursing, even if the move is to another compact state. For example, if a nurse who is currently licensed in Texas moves to Missouri, both of which are compact states, he or she must apply for a Missouri license. If a nurse moves from a compact state to a non-compact state, he or she must also apply for a license by endorsement. This essentially changes the license from a multi-state license to a single-state license. The NCSBN has a great fact sheet as well as an FAQ section with more details on compact vs. non-compact state licensing. What if My State is Not Included in the eNLC? If the nurse's state is NOT part of the eNLC, they will need to visit their individual state Board of Nursing's website and apply for a license per their requirements. It is considered a "single-state" license, so they are not able to practice in other states without endorsement. The eNLC was actually designed specifically for travel nurses, to allow them to have more career mobility. Travel nurses should first determine if they live in a compact or non-compact state. If they do live in a state that participates in the eNLC, they should be familiar with which other states are compact states. This will help them choose assignments with more ease. However, some travel nurses wish to work in a non-compact state. In this case, some states may grant a temporary license. If a state is not part of the compact agreement or does not issue temporary licenses, the nurse would need to apply for a permanent license. For more information, please click here. What it all boils down to is that all nurses, including travel nurses, should visit specific state Boards of Nursing to verify individual requirements for licensure.